Fifth Sunday in Honor of St. Thomas of Aquinas. Posted on February 26, 2017 | Comments Off on Fifth Sunday in Honor of St. Thomas of Aquinas. CONSIDERATION FOR THE FIFTH SUNDAY. St. Thomas and the Most Blessed Sacrament. Is this great Sacrament the sun around which thy life revolves? Are thy thoughts often turned toward Him who thinks of thee by day and night? His joy is to be with the children of men—is it the special privilege of thy life to tarry in His presence? Holy Mother Church, in the jubilation of her heart, finds the highest expression of her rejoicing in the sacred songs of St. Thomas; and annually on the recurrence of the feast of Corpus Christi does she enkindle by them the fire of holy enthusiasm in the breast of her children, for it was partly to his efforts that the feast owes its origin. Art thou, also, intent upon grasping the teachings of Holy Church upon the Adorable Eucharist, that thou mayest honor It, not through custom, but from the deep conviction that God Himself is hidden therein? Tantum ergo, Sacramentum. Hast thou treated God as God during the Holy Mass? when in the church? when passing the tabernacle? Art thou reverent during Holy Communion, maintaining a respectful silence is His presence, as the Holy Scripture enjoins: “The Lord is in His temple. Let the whole earth be silent before Him.” In thy preparation for Holy Communion, dost thou reflect that God is coming to thee, God, whose sanctity can brook no sin? In thy thanksgiving, hast thou not treated the “Great Sacrament” slightingly? And when at a distance, far from the church, do thy thoughts go back to thy God in the tabernacle before which burns the perpetual light, to remind thee of His uninterrupted presence there and to stand before Him as a symbol of thine own true love for Him? O Jesus, Holy Host, wonderful Sacrament! up to the present much of all this has been wanting to me! To facilitate my access to Thee, Thou didst become little, Thou didst conceal Thy majesty; therefore did I, in my wretchedness, forget that Thou art the great God, my Judge! I hear sung, “Tantum ergo Sacramentum”—“The Great Sacrament,” and my ears have grown accustomed to their sound. I sing, I repeat listlessly those words that should act as reminders. But it shall be so no more! I will choose St. Thomas as my special patron in all that concerns the Most Holy Eucharist; for he who excelled all others in so many particulars, has even excelled himself in his praise, his reverence, and his love toward the Holy Mystery. SECOND POINT.—Consider St. Thomas in his love and devotion to the Holy Sacrifice of the Mass. He is not only the Doctor, he is also the adorer of this great miracle: “Tantum ergo Sacramentum, Veneremur cernui.” His conviction of the greatness of this divine Gift was not sterile; it was deep, living, and effective. Children’s meat to dogs denied” . . . .
may be in very deed to me the “Children’s Bread!” Stand by me, teach me, and obtain for me the divine assistance, that I may not draw upon myself a refusal when I sing before the Most Blessed Sacrament thy words: “Sic nos tu visita, sicut te colimus,” “Do Thou visit us, even as we honor Thee.”—With heart and lips will I repeat the words, seeking day by day to understand them better, which Holy Church from thee learned and has already rehearsed innumerable times: O God, who hast left us in this wonderful Sacrament a perpetual memorial of Thy Passion: grant us, we beseech Thee, so to reverence the sacred mysteries of Thy Body and Blood, that we may continually find in our soul the fruit of Thy Redemption: Thou who livest and reignest, world without end. Amen. The Angelic Doctor was about thirty-two years old when there arose in the University of Paris a dispute among the Doctors and Professors, upon the manner of Jesus’ presence in the Holy Eucharist. After long arguments for and against, they agreed to leave the solution of the debated question to the young Thomas whose mental ascendancy was already felt and acknowledged. The opinion of the several Doctors was handed him in writing and his decision awaited. Thomas, according to custom, became lost in contemplation, prayed ardently, and then exposed his own convictions on the question in words short, but strictly conclusive. But he would not submit the result of his labor to the University without high approbation. He approached the altar, laid there on his manuscripts, raised his eyes to the Lord, and prayed: “Lord Jesus Christ, Thou who art truly present in this wonderful Sacrament and who dost operate that which I am to declare, I implore Thee if what, with Thy help, I have written about Thee, is true, permit me to teach it openly but if I have written anything contrary to faith and not in conformity with its teachings upon Thy holy Sacraments, let it be condemned.” Then his confreres, who were closely watching him, saw Christ suddenly appear over the writing that Thomas had laid on the altar, and heard the words: “Well hast thou written, Thomas, concerning this Sacrament of My Body; and well hast thou solved the problem—that is to say, in as far as it is possible for one to do so who still is prisoner in the flesh.”—At the same time the observers beheld the holy Doctor hovering in the air, a whole yard above the floor. He remained so long in this position, that they had time to call the Prior of the monastery and many of the Brothers to witness the astonishing spectacle. After that divine approval, the holy Doctor went to the University where he spoke so fluently and lucidly upon the disputed point that all embraced his opinion. And well they might, since He whom it most nearly concerned had, first of all, given His approbation! 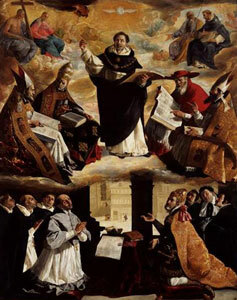 This entry was posted in Six Sundays in Honor of St. Thomas of Aquinas and tagged Six Sundays in Honor of St. Thomas of Aquinas, St. Thomas of Aquinas. Bookmark the permalink.